The decision to pursue a charge of aiding and abetting the enemy against whistleblower Bradley Manning opens the door to future whistleblowers facing execution, Jeff Paterson, director of Courage to Resist told RT. RT: You were actually at the courtroom today - what are your impressions of the conduct of the trial, and of Manning himself? Jeff Paterson: Well today was interesting. The defense rested its case, the prosecution rested its case, but then the prosecution got a chance to do over much of its case, and that in and of itself is outrageous. Ms. [Jihrleah] Showman took the stand today... she took the stand a number of times over the last few years, but this is the very first time we’ve heard any of this. She is selectively remembering anti-patriotic aspects of Bradley Manning. And that’s kind of ridiculous, it’s in writing nowhere, it’s at least the third time she’s on the stand and now all of a sudden she believes Bradley Manning is a quote-unquote spy. RT: So the prosecution was given a very big stage today - the judge refused to dismiss the charge of aiding the enemy. Is there any evidence at this point that Al-Qaeda or any other terrorist organization profited from Manning’s leaks? JP: Absolutely not. To underscore, this is the first time in US military history that a soldier is facing the aiding the enemy charge for giving information to the media for the public good. And we’re talking about over 200 years of history - this is the very first time. It could literally set a precedent to execute the next whistleblower, and that’s because this carries the death penalty. Although the prosecution is not seeking the death penalty, this case precedent could be lethal to a future whistleblower. RT: Is this scaremongering to deter future whistleblowers? 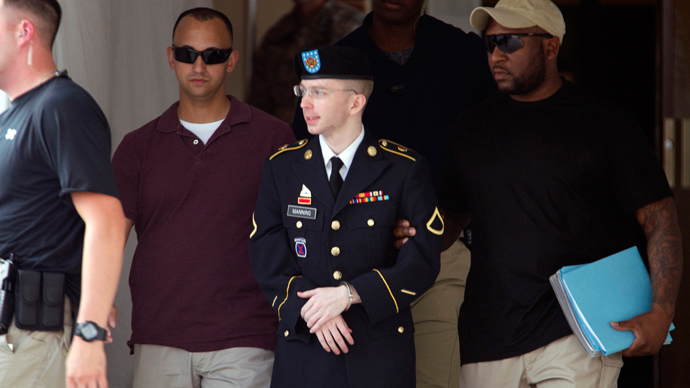 Manning's immediate superior questioned his loyalty to the US. But did she offer anything to support her allegations? JP: She offered absolutely nothing except a selective recollection, a ‘feeling’ that she had that he was not ‘right,’ that he was somehow a spy. This was the supervisor in Iraq over three years ago; if she thought he was a spy she definitely should have taken some action as the supervisor, but she didn’t. Only now, years later, she’s coming to this conclusion. She had a very contentious relationship with Bradley Manning as his supervisor, there is no secret about that, and to me this is clearly a vendetta to kick this young private while he’s on the ropes. RT: The prosecution says that if indeed Manning had leaked the information to The New York Times instead of WikiLeaks he would still be charged with aiding the enemy - alarming? JP: Absolutely, and this goes back to precedent. Regarding Ms. showman’s testimony there is not one piece of evidence anywhere in writing that Manning leaked this information for any other reason than to benefit American democracy, so we know what our government is doing, and we can hold our government accountable. RT: Why is it that the American public is largely unsympathetic to Manning while taking a much more positive attitude to another whistleblower, Edward Snowden? JP: Edward Snowden is allowed to speak for himself, he was able to hold a press conference at a Moscow airport. Bradley Manning has been held in solitary for years while our government is able to dictate the story to the media. They have not been able to speak to Bradley, and while he’s hidden away the government can say what it wants, and now someone with a vendetta from his unit can basically tell untruths from the stand about him. RT: How much fact and fiction is really going on in this trial? JP: I think the defense is trying very hard to present the facts; Bradley has admitted that he is the person that leaked the information to WikiLeaks. He wants the judge to give him a punishment that is reasonable in that regard, but he’s fighting tooth and nail for his life against these overcharges that will set a tremendously bad precedent for all future whistleblowers.